Last week I encountered rather interesting issues regarding threading, .NET and interaction with COM. The Test class is simply a windows form that contains a folder dialog which is obviously used to select folders. The preceding snippet will fail as soon as we try to access the folder dialog. But in other cases - when we're working with multiple threads, like in the following snippet, we need to set STA on the actual thread. Now you might wonder what this STAThread attribute is all about? First of all STA (Single Threaded Apartment) relates to a threading model being used in regards to COM objects - the folder dialog in the example makes a call to the Win32 API - which is a COM call. Looking at the image, notice the two silver rectangles - we call these silver blocks apartments, now an apartment is simply a cosy little place where our com objects live. 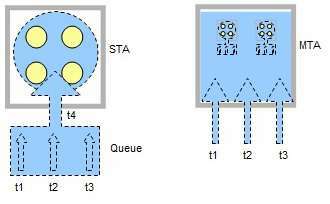 The yellow circles represents objects within our apartment, t1 - t4 represents threads trying to access the objects within our apartment (in this case only t4 gains access to the objects, while t1-t3 waits in a queue). Back in the day before threading, we didn't need our objects to be safe against multiple processes modifying/accessing it at the same time - but as soon as multi threading came into the picture, it became important to isolate our objects.